...Elder Mathes Guice of the Koinonia Worship Center in Pembroke Park said the county tourist council's marketing targeted to gay visitors "led the spiritual community on a collision course with Satan." 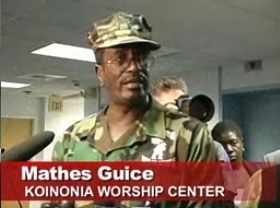 The senior pastor of the Koinonia Worship Center is a fellow Broward County mayor, Eric H. Jones of the City of West Park, and the military outfits were introduced a few months ago. The men's ministry of the Carver Ranches-based Koinonia Worship Center will begin canvassing the drug-infested neighborhoods and crime-riddled streets of Deerfield Beach, starting this weekend. Dressed in camouflaged military fatigues, Deacon Mathes Guice, and other members of the ministry, will join the Rev. Nathaniel Knowles and other pastors there to begin the process to address crime and violence in the city. I've never heard to this group before, the ones in military dress. They concern me a great deal. When I entered City Hall yesterday evening to observe the press conference the Mayor had called with them. Two of them escorted me from the front doors on the north side of the building to the elevators and then stood and took up 'posts' in the elevator lobby. Spaulding notes that Koinonia has a web presence on My Space. An audio message there uses a lot of the "spiritual warfare" language typical of the conservative Christian "men's movement" (see this essay by Jeff Sharlet for an overview), but aimed specifically at African-Americans (there are a number of US churches that cater to the needs of black Americans; Barack Obama is associated with one, to the outrage of conservatives). Christians are making a public stand against homosexuals in various locations around the world just now; I noted a rally in Uganda a couple of weeks ago, while Protestant Christians in Ukraine are currently planning a march supporting "criminal penalties for homosexual propaganda and popularization". I've found "militarized pastors" of various sorts popping up here and there lately, and I don't see evidence, so far at least, of any direct federal encouragement, from the Bush Administration. Rather, I'd say it might be an authentic, local, indigenous expression of the newly ramped-up "theology of war" which has long been, of course, latent but has reached the status of cultural malignancy during the years of George W. Bush. Militarized Christianity seems in the zeitgeist, and why not ? - if Christian organizations, as promoted by the Bush Administration under the "faith based" initiative, can play quasi-governmental roles, why can't they play quasi-governmental military roles as well ? Of course, there are pesky First Amendment issues, yes, but the Bush Administration has proved capable of sidestepping and circumventing those, to establish precedent on the ground. It's no wonder that such self-appointed, "militarized ministries" are popping up, and the choice of uniform seems somehow quintessentially American - casual, and practical. No brown or black shirts : khaki is the uniform of choice. Pastor John Hagee stated, to Terry Gross in a 2006 Fresh Air interview,m that Hurricane Katrina was God's punishment on New Orleans, for a gay parade held not long prior to the hurricane disaster. I wouldn't be surprised if Guice began to spout that line, to predict an immanent hurricane hit as punishment for the county's pro-gay marketing. I remember urban legends spinning hurricanes differently.